Seward Middle School Student Leadership Rep. The public is invited to the next meeting of the Site Council. It will be December 13, 2012, at 6:30 PM in the Seward Elementary School library. Elections were held during the November 8, 2012, meeting. Posted in News | Comments Off on New Officers! December: Pros and Cons of moving the 6th grade will be shared by representatives from two schools who have gone through this process already. January: Public will be invited to comment. 3 minutes per person. You may also share your thoughts with your school’s site council representative. Seward Schools Site-Based Council will have elections on Nov. 1 & 2 for three open seats. YOU can fill one of the seats! You are invited to be part of a comprehensive advisory council that assists in the development of our area school programs; works as one decision making team, with decisions being made through consensus; and is informed and up to date on the current programs within our schools. The council meets the 2nd Thursday of every month during the school year and has 7 meetings a year. There are three open seats, and each is for a 3-year term that begins in November 2012. Please pick up filing forms (applications) at any one of Seward’s three schools, or download it from http://bit.ly/StrfBN. The application is due on October 30th, 2012, by 2 p.m. at the latest and can be turned in at any of the schools’ offices. For further information, please call Julie Lindquist at (907) 288-3166. Elections will be held on Nov. 1 & 2 at each school from 9am until 2pm. Please come and vote! Posted in News | Comments Off on We Need You! 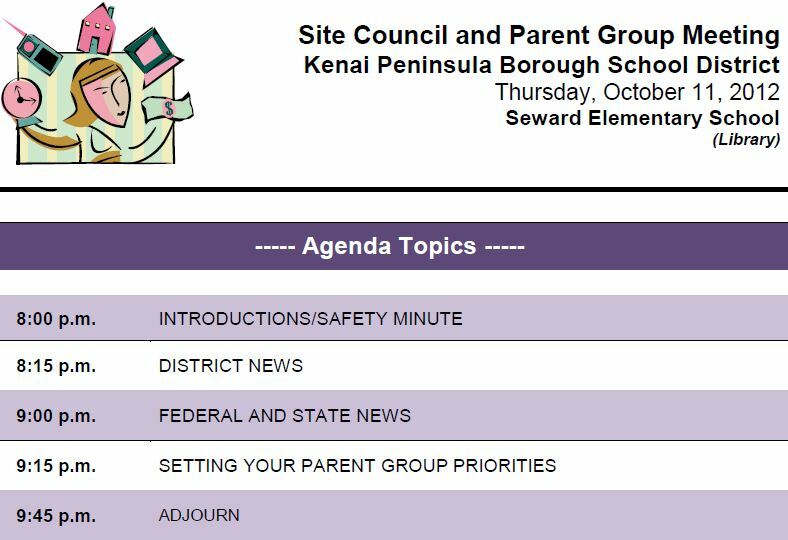 The Seward Schools Site-Based Council meeting begins at 7 PM, and the portion of the meeting led by Dr. Atwater, KPBSD Superintendent, begins at 8 PM. Please come to the whole meeting, or just to the training if you’d prefer. Posted in News | Comments Off on TONIGHT! Become an Officer of the Site Council! You are invited to be part of a comprehensive advisory council that assists in the development of our area school programs; works as one decision making team, with decisions being made through consensus; and is informed and up to date on the current programs within our schools. The council meets the 2nd Thursday of every month during the school year and has 7 meetings a year. There are three open seats, and each is for a 3-year term that begins in November 2012. Please pick up filing forms (applications) at any one of Seward’s three schools or download it here. The application is due on October 30th, 2012, by 2 p.m. at the latest and can be turned in at any of the schools’ offices. For further information, please call Julie Lindquist at (907) 288-3166. Elections will be held on Nov. 1 & 2 at each school from 9am until 2pm. Please come and vote! Posted in News | Comments Off on Become an Officer of the Site Council!